I decided back in January of 2018 to share our family’s spending publicly for a whole year. This was an attempt to prove that doctors do not have to spend a totally ridiculous amount of money to live well and love life and more importantly a strategy to make us take a cold hard look at where all our cash was going and decide whether we liked what we saw. It may come as a surprise to some people that even though we have been obsessively tracking our spending, we do not do traditional budgeting. You absolutely should do traditional budgeting if that works for you as a way to control your spending. More on this topic here. What did we spend last year? Our family’s spending for 2018 came to $78,708.38. That’s for our family of 4 (2 adults, one 12 year old, one 1 year old) in a high COL town, including daycare, insurance, rent/mortgage, and mandatory student loan payments. 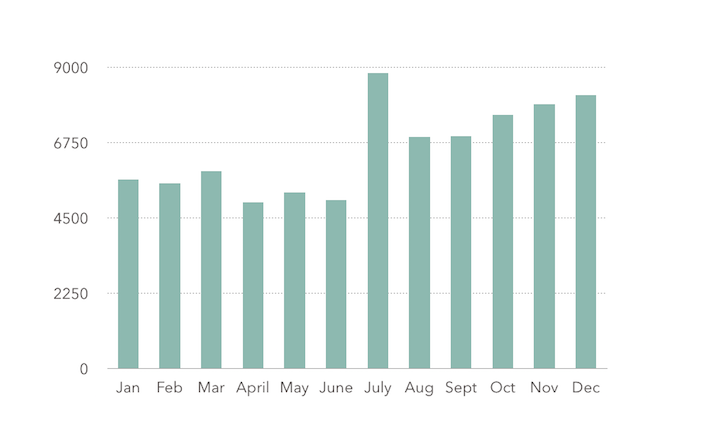 We actually kept track of our spending all year, month by month. Here is the post for December, which contains links to every other month. For the sake of argument, in case there’s anyone out there saying “You really should have included X in your ‘home’ spending!” or “Don’t you think you might have missed something?” we’ll go ahead and round that up to a nice even $80k. What was included and what wasn’t? The most important use of our money that does not show up in “home/family spending” is our charitable donations. While I know this can be a touchy subject, particularly for people who feel like they are barely scraping by as it is, I do encourage everyone to find ways that work for them in their current season in life to give to those who are less fortunate. If you are lucky enough to be on the internet and reading this blog post, you were probably born into a better position than several billion people in the world. Give back however you can. Business expenses do not show up in home spending, because the business is its own entity (a partnership and LLC) and those expenses would all go away if I sold the business and/or switched careers. Student loan payments do show up in home spending, because those don’t go away – well – ever. They are like the cockroaches of personal finance. Life, disability, and medical insurance do show up in home spending because they are what protect our family’s lifestyle in the event of catastrophe. A good chunk of that spending went to pay for our primary home, which is not unusual for people in our stage of life. 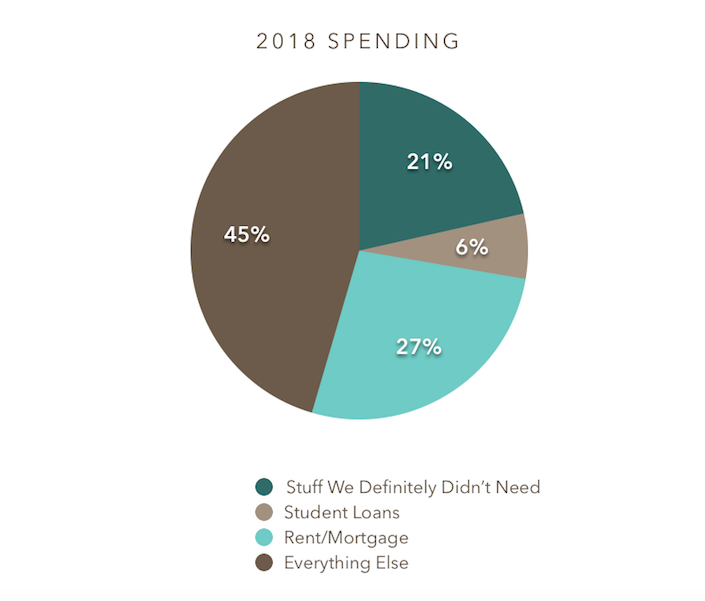 I’ve said this several times before, and I will say it again because I think it’s important: even though our mortgage is a huge percentage of our spending in a typical month for us, it is far less than that if looked at as a percentage of our income. If you’re not in a position to take on a mortgage, remember that there is nothing wrong with renting or having roommates! Another good chunk of money naturally went to utilities, groceries, and daycare – things most people consider essential. They are also boring, as purchases go, so let’s not spend too much time on them. Instead let’s talk about the line items in my family’s spending that most people would agree are luxuries. That is, let’s talk about the areas where we could definitely have spent less. Was all of that 80k necessary for a good life for our family? We spent over $3,066 just on things like movie tickets and fast food. We do love a good dose of Chick Fil A sauce followed by a show on the big screen, but no one can argue that those things are necessary. There is no appreciable change in our quality of life when we stay home, make our own popcorn, and watch movies from our couch. This cost us $1,000 in October. I don’t want to talk about it. We spent a whopping $4,124 in this category. None of these improvements were necessary for our home to be livable (although we have learned a lot and we’re really enjoying most of the changes we made). They included things like updating the kitchen cabinets, installing a fancy gas fireplace, and replacing a fully functional older dishwasher with a new ultra-quiet Bosch – the very definition of luxury purchases. While skiing is a favorite hobby of ours, season passes to our local resort are solidly in the “things we don’t really need” category. These totaled $1,280 last year. This is an obvious one, right? While we do love traveling to far-flung destinations, there’s no reason we have to do it to be happy. In fact, cars have only been widely available in the USA since the early 1900s, and commercial air travel didn’t get popular until a couple decades after that. High-speed worldwide travel is far from essential for a fulfilling life. The thing we enjoy most about travel is that it’s a way to pursue adventure with people we love, and it turns out that adventure is always available for negligible cost plus a little physical effort. 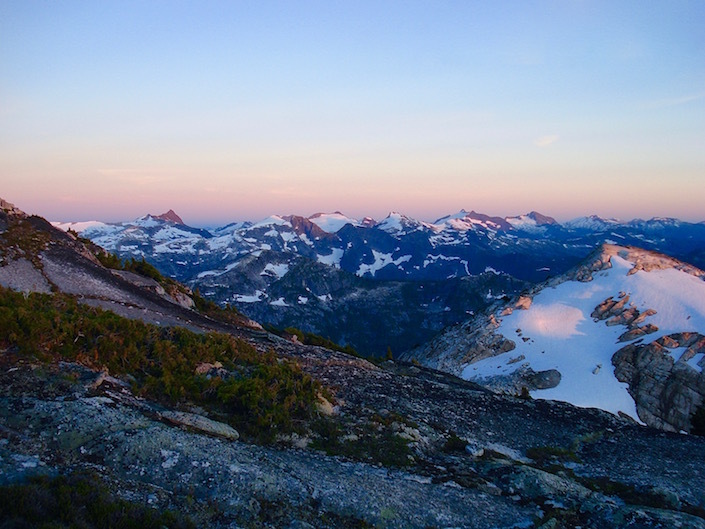 If we had enjoyed a year of hiking, biking, exploring lakes and creeks, camping, etc, instead of all that long-distance motorized travel, we would have saved $7,799. So our total amount of “Obviously Unnecessary Luxury Spending” was $17,170. This drops our total “Possibly Necessary” spending for the year to $62,830… but wait! Even that number contains a whole bunch of unnecessary fluff such as: a Netflix subscription, several electronic devices that mostly serve to cause fights between us and our preteen, a drip system in our yard so we can grow non-native flowers, massages and other spa treatments, and hundreds of dollars’ worth of pointless grocery items like holiday-themed candy, flavored sparkling water, and Pirate’s Booty. I’m not going to comb through those numbers in any more detail, but I think we can safely say that we could have dropped our 2018 spending below $60k with no appreciable change in our quality of life or happiness. In case you didn’t catch it above: that’s for a family of 4 in a high COL town, and includes rent/mortgage, student loans, insurance, and daycare. What if we had already paid off the student loans (or never had any)? We saw our monthly payment on student loans drop from $834 in January to $283 by December due to some strategic repayment of certain loan groups within our larger loan amount. However, if we had gotten rid of my student loans completely before the start of 2018, our spending would have dropped by $4,981. Having no student loans would have brought our spending down to $57,849. What if we had already paid off the mortgage? It seems like a lot of the FIRE gurus who publish their annual spending details have either paid off their mortgage or are otherwise “house hacking” (renting out rooms to cover the mortgage, living with family, living in an RV, etc). While house hacking is a great idea and I’m often very impressed with these people, we’re not doing any of it right now. We were renting a 3-bedroom house for the first half of 2018, and now we have a full-blown “normal” mortgage that costs us a couple grand per month. Our rent/mortgage cost us $21,474 last year. If we hypothetically owned this property outright, we still would have paid about $3,780 in property taxes and homeowner’s insurance. So let’s say owning our home would have reduced our spending by another $17,694. In this dream world of no mortgage, our 2018 spending would be down to $40,155. In the not-too-distant future we plan to have no student loans and no mortgage. However, we will probably still want to travel and ski and eat out and otherwise have some fun and flexibility in our non-essential spending. So let’s take that $40k and add all our luxuries back in: $40,155 + $17,170 = $57,325. Viola! That’s what we’ll need in today’s dollars (adjust accordingly for inflation) in the future to sustain our current lifestyle once the mortgage and student loans are gone! Obviously some things will change as time goes by. We won’t have daycare expenses in a couple years (which were over $5k in 2018), but healthcare may cost more. We might spend less on air travel and more on fancy restaurants. We don’t know for sure what life will look like in 5 years or 10 years – or even tomorrow. The future is unknowable, which is equal parts exciting and annoying. Still, this is super useful information for the purposes of planning for the most likely scenarios in our lives. And there is a ton of luxury spending (and insurance coverage) built into that number, so we’re as ready for the unexpected as anyone can reasonably be. Interesting post, thanks for sharing your numbers. Where is the banner image from? Looks like an amazing place! Hello there! Thank you for sharing your information! I have certainly picked up some new ideas from this. What program are you using for those charts?